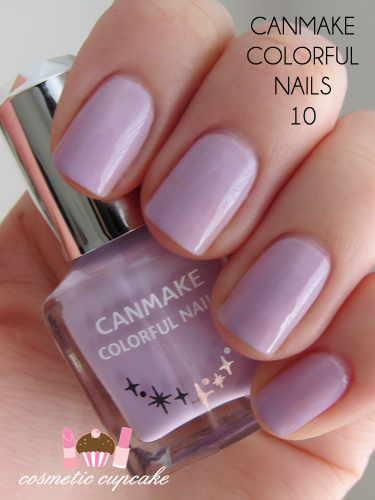 Canmake Colorful Nails 10 is a very pretty milky lavender polish. It's so soft and delicate! This would look great layered underneath a sparse glitter such as Tony Moly or Deborah Lippmann Glitter in the Air but I loved the soft colour so much I wore it alone. The brushes are on the small side but easy to use and dry time was very reasonable. 2 coats is pictured - a thin coat to start followed by a thicker 2nd coat. Details: Canmake polishes are available in most of Asia. For international ladies I found it on Yesstyle.com.au. Have you tried Canmake polishes before? Thanks for looking as always! This one is so amazing! I love the colour. This is a gorgeous colour, I love the bottle too! I am such a sucker for pastel purples! Glad you like it too Steph! Oooh, this is so pretty! My exact thoughts =D I'll be wearing it again and again definitely! I haven't tried Canmake polishes before, but I really love how delicate this pastel purple is! So pretty! It's just such a lovely soft colour. You really should try Canmake yourself! wow!! that is a gorgeous shade of lilac!! Aww it looks simply lovely on you! the color is so sweet! Glad you like it :D! Need to pick up more Cancam haha! Thank you Moni!! It looks so so delicate on the nail. I love it so much!! <3 Lol definitely need to =D I want their other pastels! Just gorgeous! Such a pretty subtle colour. I wonder how this compares to Essie's Lilacism? So beautiful! How do you paint your nails so perfect. As in how do you avoid getting any on your cuticles?